Minim™ is an IoT platform that enables and secures a better connected home. In a world where connected devices have outnumbered people, Minim’s self-learning platform employs Quantum Fingerprinting and behavioral models to detect threats before they become problems. Founded in 2017, Minim offers apps with usable security for consumers and their care providers to protect connected devices and optimize WiFi performance, leading to higher customer satisfaction. The company is now partnering with ISPs, care providers, router manufacturers, software developers, and IoT device manufacturers who want to help make home connectivity as safe as drinking water. 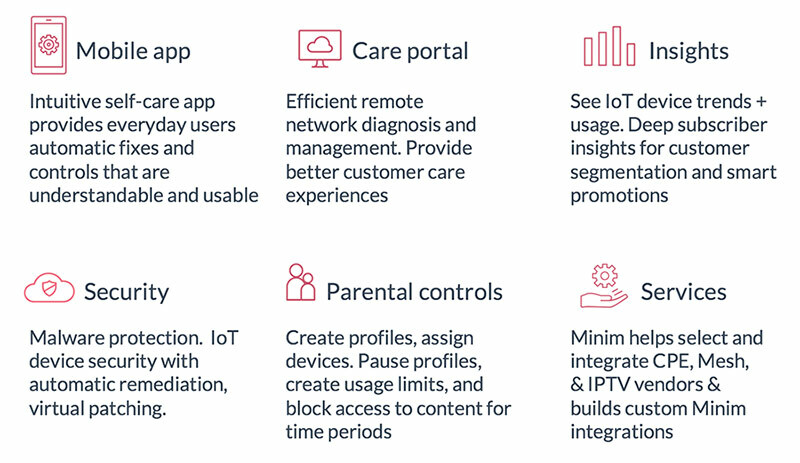 Minim’s cloud platform delivers the most advanced management and security features as connected devices explode in homes.